Here’s the dirty secret of many wine writers: we don’t buy all that much wine. There’s an endless supply of unsolicited samples, and many wineries and importers are happy to send us wines we’re curious about. We do often pick up a bottle of wine for a particular dinner, or a few more bottles of a wine we liked from a tasting. And wine writers are among the most adventurous people ordering from restaurant wine lists. But while there are exceptions -- Robert Parker is famous for buying wines he drinks at home -- you won’t often find wine writers shopping the way wine-loving “civilians” (to use Jay McInerney’s term) do. Thus it was a treat for me last week, staying with my friend Myles in New Jersey, to head to Bottle King to help him buy some wine. A big treat. I loved the 30 minutes we spent there, and I’ve got childlike excitement about the wines he bought. I simply can’t wait for his assessment; I want to vicariously recapture my own discovery-of-wine phase. Myles has only been drinking wine for a few years and doesn’t drink very often. He started with New World reds -- Peachy Canyon Zinfandel was the first wine I poured for him that he adored -- but these days he’s into whites. He doesn’t eat shellfish or spicy food, and rarely eats fish at home; most of his wines will go with chicken, pasta or Chinese takeout. With food, he’s not into exotica, and while he’s willing to trust me to a point, I don’t want to spring a Vin de Savoie on him. He recently discovered Pinot Gris and likes it -- Trimbach is his favorite -- but he doesn’t like Italian Pinot Grigio. He isn’t a fan of buttery Chardonnay but I suspect that his girlfriend would be if she knew the vocabulary. He thinks he doesn’t like Riesling because it’s sweet. He also thinks he doesn’t like Sauvignon Blanc because it’s too acidic and smells like cat pee. And he doesn’t like sparkling wine because it gives him a headache. As for budget, he’s been shopping in the $15 range, which is a sweet spot right now. He’s willing to go to $20 but starts to make Tuvan throat singing sounds at about $25. As a point of pride I wanted to get him wines priced below his current average expenditure. I also wanted to expand his horizons. This is practically my mission in life -- if you think Family Guy is cool, you need to watch Robot Chicken. Single finca coffee is more interesting than country blends. Have you listened to Sonic Youth, Wilco’s “Yankee Hotel Foxtrot,“ the Standells? That sort of thing. Wine lends itself to that, but you have to know your limitations. I think the Ramones were gods who walked the Earth, but I know I won’t convince a Beyonce fan of that. So enough chatter: What did we buy? First I examined the stacks of wine at Bottle King, which is a pretty good suburban all-purpose store (and you can order many of my selections from them here). It doesn’t have the kind of obscurities I might want, but it does have very good prices and at least a few selections from most necessary regions. That said, I found the cases stacked in the center of the aisles to be nearly all boring corporate wines, the sort of stuff I would only drink on an airplane. I guess it’s not surprising that this is where most people pick up their wine, rather than the shelves. There’s a saying among wine distributors: “Stack ‘em high and watch ‘em fly.“ The stacks are the lowest-common denominator, mass-appeal wines: the Top 40 of wine. If you’re a top 40 listener, then shop there. Myles is still looking for an obscure Impotent Sea Snakes album (“Too Cool For Rock And Roll,” if you have a copy PLEASE email me.) He needs to shop on the shelves. I did pick up one bottle from the stacks: Kono Marlborough Sauvignon Blanc 2008 ($8). It was the last bottle, and I forced it on him because it was a good price and because I like that Kono is actually produced by Maori. He didn’t know who the Maori are, so maybe I started off slowly. But what’s $8 of somebody else’s money? From the shelves, we started with Trimbach Alsace Riesling 2007, on sale for $15. Myles complained that he doesn’t like Riesling but I counted on his positive connection to the Trimbach Pinot Gris to help me cure him of this misconception. He was in the market for a California Chardonnay for his girlfriend. They had Ridge -- one of my favorites -- for a cool $54. Maybe if they get engaged. I was depressed by the under-$20 options; most were general California appellation, and you don’t get single vineyards for that money. I settled on the Sonoma-Cutrer Sonoma Coast Chardonnay 2006 ($19), a brand I like that claims to be estate bottled, though whether or not that means it’s an estate single-vineyard in California, I can’t honestly say. I told him he really should compare the California Chard style to Burgundy. He was amenable, but there weren’t a lot of great values in white Burgundy; even village-level wines were over $20. He never had Chablis before so I settled on a Gilbert Pico Chablis 2008 ($18), a brand I haven’t tried. I warned him that these are austere compared to California and should be drunk with food rather than as a cocktail. Still, while I like a good Chablis, this is one of the selections on which I most fear failure. In contrast, I feel good about putting the Domaine Mardon Quincy Tres Vielles Vignes 2008 ($15) in his basket. I also don’t know that brand, but I think Quincy is a great alternative to Sancerre at a lower price; $15 ought to net a good one. I didn’t tell him it’s Sauvignon Blanc (he doesn’t read my blog); I’ll spring that on him when he likes it. The Spanish white section was weak, but for the price I couldn’t resist the Dom Bardo Rias Baixas Albarino 2007 ($9). I’m not sure he’ll love Albarino as much as I do, but the risk is low, and sometimes you have to try to expand somebody’s horizons. My average cost was a little high at this point so I was delighted to see some vinho verdes. 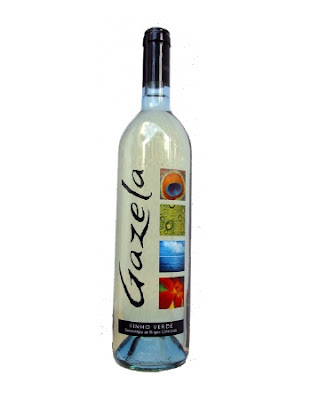 I got two: Gazela 2009 ($5) and Casal Garcia 2008 ($5). It’s pretty cold in New Jersey right now, so it’s not ideal vinho verde weather, but the price is right for nights when Myles might want a single glass of wine and would resist opening even a $10 bottle. Nearby, I also snagged the Skouras White Roditis-Moscofilero 2008 ($8). It would be a bigger hit if he ate more seafood, but at that price it’s a steal even with chicken. In my discussion of the awesomeness of Riesling and how to look for good ones, I had been depressed to see no Trockens and only a couple of huge-production-looking Kabinetts. Thus I was pleasantly surprised to see a case of Fritz Windisch Niersteiner Spielgelberg Riesling Rheinhessen Kabinett 2007 ($9) near the cash register. Again, not a brand I know, but it’s 8.5 percent alcohol, so he and his girlfriend can drink a whole bottle, which might be a treat. Just before we left Myles grabbed a half-bottle of Veuve Clicquot NV and put it in the basket. I objected. He said his girlfriend’s birthday was coming up and she liked that wine; otherwise, he wouldn’t buy sparkling wine, as it gave him a headache. I told him that it’s a mass-produced corporate product not even made by the traditional method in that bottle size. I called it the equivalent of Michael Bolton -- that got him where he lives. I insisted that I would find him a better full bottle of bubbly for less than whatever they were charging for the half bottle of Veuve Clicquot, an outrageous $18. I fingered the Roederer Anderson Valley but instead grabbed the Gloria Ferrer Blanc de Noirs ($15), a longtime favorite of mine. He was still skeptical, but this was the selection in which I’m most confident. Anybody who thinks Veuve Clicquot is good value should switch to this wine immediately. We ended up with 11 wines for $126 -- an average cost of $11.50, very affordable for everyday use, even with a couple of more special-occasion bottles thrown in. There was more I wanted him to buy: a Falanghina, a Cremant de Bourgogne, an Oregon Pinot Gris. I wanted him to splurge on a Tokaji Aszu 5 puttonyos for his girlfriend’s birthday. But it’s his money, not mine, and I had fun spending it. Now I can’t wait for the reviews to roll in. Will he find the Albarino too acidic, the Kono too grassy, the Chablis too flinty? Maybe, but we’ve been friends so long that I was the one who introduced him to George Clinton and rice milk for breakfast cereal and shaving cream in a tube rather than a can. So even if the Skouras is corked, I’ve got some goodwill built up. And that Gloria Ferrer is going to earn me even more. Enjoyed your shopping piece and thought I’d help clarify the Sonoma Cutrer situation. They have a half-dozen estate vineyards, all but one in the Russian River. The Les Pierres Vineyard, down in Sonoma Valley next door to Durell, creates the Sonoma Coast appellation when they blend. They also do a Founder’s Reserve that’s mostly Club Cutrer, Winery, top accounts etc. Winemaker’s pick each year, often from blocks at Les Pierre, about five barrels. Winemaker Terry Adams, who has been there since before they bottled the first vintage, is retiring and a new winemaker will be selected soon. Could be interesting to see the influence of new thinking, since Terry has watched over all the vintages since 1981. BTW, they’re making some killer RRV Pinot Noir now as well. I'm with your friend on the preference of Pinot Gris to Pinot Grigio. Since it sounds like you recommended a lot of wines to help Myles expand his horizons, I'm curious to know if you'd recommend "gateway" wine (pardon the reference!) for him or someone like myself who wants to bridge that gap between a beautiful, ripe Pinot Gris (from what I've had) lackluster, thin, spiritless Pinot Grigio. Is there purchase out there that could pique our interest in PG? Hey Susannah, I would generally stay on the other side of that gate, drinking just the Pinot Gris. It is the same grape, but using Pinot Grigio seems to indicate the style the producer is shooting for. The one exception is that there are a very few interesting Pinot Grigios from the Alto Adige region. I am not an expert on them because I rarely order Pinot Grigio, but this is the source of the only good ones I've found. That said, I'd rather drink almost any other white varietal from Alto Adige: Gewurztraminer, Pinot Bianco, Muller Thurgau, Sauvignon Blanc. Hmm, maybe those are your gateway wines. Doesn't sound like you are too big on the Pinot Grigio, either. But I'll have to keep an eye out for an Alto Adige; I don't think I've had one, so now I'm curious. Thanks for the suggestion.